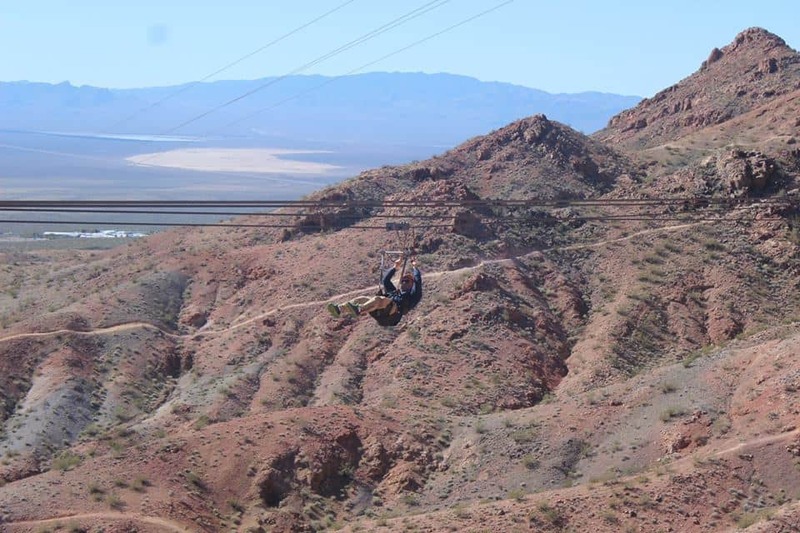 An Epic Zip Line adventure to add to your Las Vegas experience! Happy to announce we are now booking Bootleg Canyon Flightline Zipline Tours just 5 minutes from our ride site at Eldorado Canyon! What a fun way to see Eldorado Valley from above. After your ATV Tour with us, why not go ziplining? If you’ve got the time….we’ve got the fun! Be sure to mention this when booking your ATV Tour and we will get you scheduled for both activities. At Above All…We Have It All! Children are always welcome to enjoy this awesome experience too! Children under 18 must be accompanied by a parent or guardian and must weigh 75 lbs or more. Come and experience the thrill of our Zip Line tour as you soar from the top of Red Mountain in Bootleg Canyon Park to the mountain base on Nevada’s first ever zip-line adventure. Discover breathtaking views of Las Vegas, Lake Mead and the Eldorado Valley, while our eco-tourism guides take you on an interpretive journey over the desert ecosystem. Flightlinez Bootleg Canyon is located in Boulder City, Nevada in the beautiful Mojave desert. 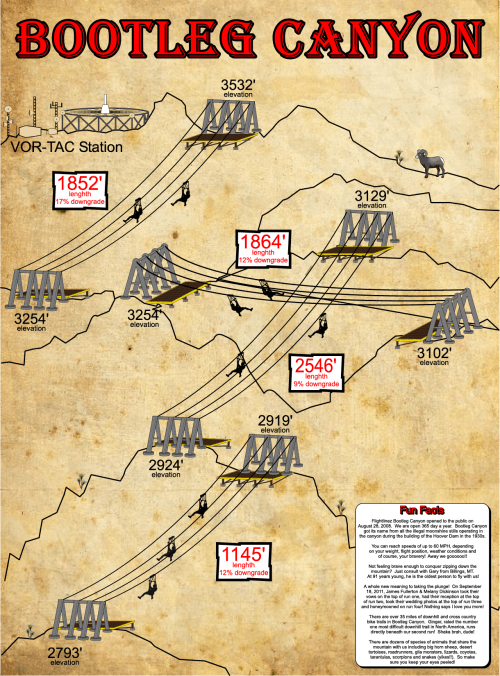 The aerial trail system consists of a multi-run and multi-line series of flightline trails ranging in length from 1,150 to 2,546 feet. Full training is given before being shuttled to the top of Red Mountain apx. 3600 feet above sea level. Then you will begin the descent on the series of 4 lines flying across canyons at speeds of up to 60 mph! -1.56 miles of flightline trails. -Min. weight is 75 lbs. Max weight of 250 lbs. -Tour lasts approximately 2.5 hours from start to finish. Q. How many ziplines are there? A. 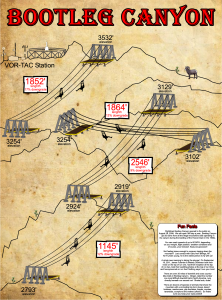 You will fly down 4 separate ziplines that cover just over a mile and a half of the canyon. A. Once you start the safety class your tour will take about 2.5-­‐3 hours to complete. A. In Boulder City, NV about 25 miles SE of the Las Vegas Strip. We are about 10 minutes north of the Hoover Dam and 5 minutes from downtown Boulder City. A. Dress appropriately for the weather. We do NOT recommend that women wear skirts. You MUST wear shoes that cover your toes completely and secure to your feet. Sunglasses are recommended. You can wear a hat, but there is no guarantee that it will not fall off. A. We would not be open. Q. Will I fall out of my harness? A. No. We would not be open if you could. Q. Do I have to hang on the whole time? A. No you do not. The harness is very supportive and comfortable. The guides will go over when you are to release your hold and where you are to be holding during the safety speech. A. You are welcome to bring a camera with you as long as it has a strap (wrist or neck). You are NOT allowed to take pictures while in flight for safety reasons, however if you have a means to be “hands-­‐free” you are welcome to take pictures/video during the flight. We do NOT allow selfie sticks. Q. Is there any hiking involved? A. There is a 15-­‐minute hike after the van ride up the mountain. You are hiking up a mountain bike trail switchback. The guides DO stop halfway and encourage our guests to stop as often as necessary. Q. Is there any training involved? A. There is a safety class prior to getting on the bus for the ride up the mountain. The guides for your tour will go over the basic information about the tour as well as safety information about the equipment and experience. Q. What if I decide at any point that I don’t want to go? A. We do not want anyone to experience the flightlines if they do not feel they can complete it. If someone should choose NOT to fly after they arrive we can issue gift certificates that have a 2-­‐year expiration. If they choose NOT to go and cancel more than 24 hours before their tour, we will issue a refund minus $50 per person booking fees. Q. What if there is bad weather? A. “Bad” weather is determined per individual, not always by the actual weather. Some people do not arrive prepared for a change of temperature or mild precipitation. If a guest(s) would like to cancel due to weather and WE have NOT canceled the tour, we will rescheduled them or can issue gift certificates with a 2-­‐year expiration. If WE HAVE canceled the tour for weather, try to reschedule the guest(s) or give them gift certificates. If neither option works, give full refund. Q. Will I have the chance to see any animals? A. The Red Mountains are filled with wildlife. The earlier tours have a better chance of seeing big horn sheep. The afternoon tours will have a better chance of seeing several different species of lizards on the mountain. Q. Can I tip my tour guides and drivers? A. Tipping your guides and drivers is GREATLY APPRECIATED. They work very hard to ensure your safety on the tour while entertaining and informing you about the beautiful surroundings. A. The guided tour can take up to 2.5 hours. It consists of a van ride to “basically” the top of the mountain; at this point you will have a 10-­‐15 minute hike to the first platform. The guides will stop half way up the hike and are more than happy to stop at any point along the way if necessary. Once you reach the top of the Red Mountain, you will be about 3800 feet above sea level. From this point you will ride a series of 4 separate ziplines that will bring you back down the mountain over the canyons. Our first run is 1852 feet long. It has a 400-­‐foot drop at a 17% grade and can get you up to speeds of 60 mph. Then the ziplines get progressively longer until our 3rd run, which is 8 feet short of half a mile. Our last line is the shortest at a quarter of a mile. Once you have finished the series of 4 the van will pick you back up and bring you back to the shop. Actual time on the lines is about 3 minutes but there is always the possibility of an “extended” tour. We have positive and negative lines and Mother Nature and following directions can affect how you fly down the lines. If you don’t have enough speed or the wind is blowing against you, there is a chance you may not make it over our landing platform. If this is the case, one of our trained guides will come out and “rescue” you. It definitely adds to the entertainment of the group and the bird’s eye views are amazing. A. Our tour is a whole Eco Adventure. There is a little bit of hiking, you get great views of the surrounding areas and you have the chance to see wildlife. Each of our 4 runs has 4 lines next to each other. Each time a rider comes down the lines we have to reset the breaks for the next group of 4 to come down. Some decks take longer to set brakes than others. Once your group is done with one run as a whole, everyone moves collectively to the next run. The time you spend on each deck is minimal but entertaining. Q. Which tour time is the best? A. This is going to be dependent on what the guest enjoys. The earlier tours (&am, 8am, 9am) have a better chance of seeing wildlife. The 12pm will be the best temperature in the summer and the 2pm will be the hottest. Q. How strict are you on the weight limit? A. VERY STRICT. We weigh everyone upon arrival. If you come in over 250 pounds or under 75 pounds we will NOT allow you to fly for safety reasons. Q. Why do you have a weight limit? A. It is NOT for the ziplines themselves. The lines can hold the weight of a semi truck. The weight restriction is in effect because of our independent braking system. Right now the brake boxes we have developed can only handle up to a certain weight. If a guest weighed over our weight limit and decided NOT to follow our very important directions or the wind is causing a tail wind, the guest could get seriously injured. Therefore our insurance company does NOT allow anyone over 250 pounds.